Well it’s that time of year again. Time to get organized and set new goals for the year ahead. I would encourage you to think about your own turning goals. Consider stretching your turning horizons and join your local turning club. If you are already a member, volunteer to conduct a demo or bring a finished piece for your club’s show and tell. You can’t cross an ocean with one foot on the dock! 1. Demonstrate my spring pole lathe for my club. 2. 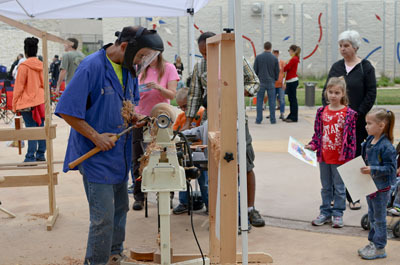 Attend the Southwest Association of Woodturning Symposium. 4. Visit Berdoll Sawmill & Furniture Co. A mill east of Austin that handles extremely large trees. For example rare 30”+ diameter mesquite trees! 5. Teach my 11 year old son some basic turning skills.